On March 21, Dr. Holt had the honor of presenting on Western University’s Pomona campus, which was live streamed to the University’s Oregon location. This lunchtime session dove into how to make the healthcare setting a safe and welcoming environment for LGBTQ+ patients, including the impact of the waiting room, intake forms, and patient interactions. In addition to discussing what LGBTQ+ patients are at higher risk for, we discussed how to start conversations on sensitive topics, such as sexual health, trans health, coming out, and LGBTQ+ suicide risks. The audience consisted of students who were interested in learning more about LGBTQ+ health. 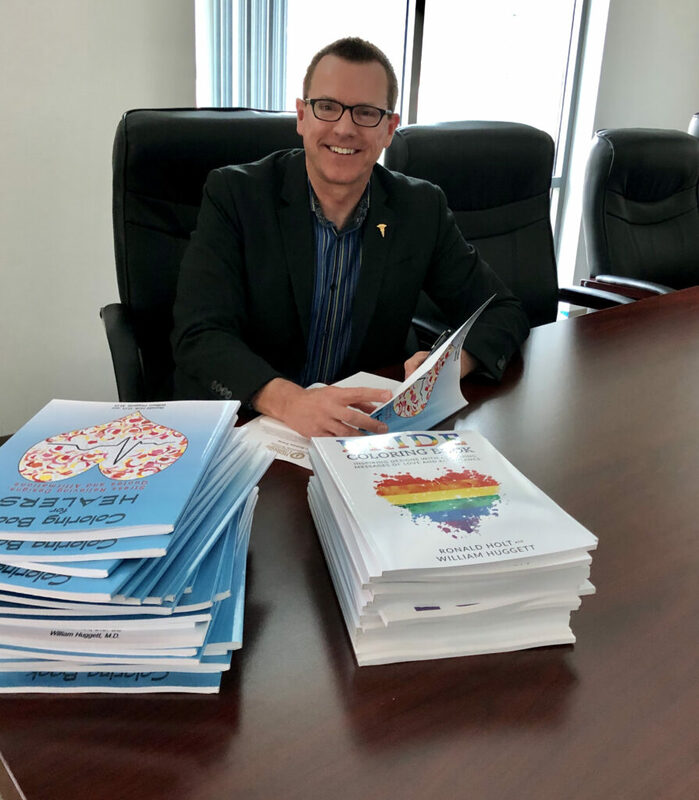 Attendees received signed copies of PRIDE Coloring Book and Coloring Book for Healers while supplies lasted. Thank you for providing valuable insight and tips for all of us future healthcare providers. Your lecture was amazing. I appreciate you and the work you are doing. I learned how to make intake forms, office settings, and exam rooms to set the stage for LGBTQ+ members. Very influential, very inspirational. I am very grateful. My brother came out in college, isolated and contemplated suicide. When he came out to me and my parents a year later we were all supportive. Thank you for giving me the tools to support those who aren’t as fortunate. This talk was great in that I learned practical ways/things I can implement to make pt’s feel comfortable, such as how to use pronouns, and creating intake forms that are more comprehensive. This was beautiful and enlightening. I really want to be a multi-cultural and gender psychiatrist and this affirms how much this is needed, so I know this is what I should be doing. It is essentially important to our future to learn, educate, and support everyone. Knowledge about LGBTQ community is so important. Really great, meaningful, and informative! More schools should incorporate LGBTQ into their curriculum. I’ll be more mindful of the language I’m using (open instead of heteronormative). I learned each person is walking into the clinic with his/her/their own story, and that providers need to show up and be present. Listen without judgement. Thank you for sharing your own experiences. This talk was very helpful. I learned useful examples of how to create a safe environment. Thank you for your time to talk about this topic. I have a much boarder view about this topic and now I know how to open the conversation. I have a family member that is gay and I have been struggling on how to start the conversation. Our relationship has been distant and I would like to start the relationship right and your presentation really helped me. Thank you. I enjoyed his perspective every much. He spoke from a place where he could see both sides to the doctor/patient encounters. I learned how to make a pt feel comfortable prior to even meeting their doctor. Thanks you for sharing. It means a lot! Knowing stats and having examples of affirming non-invasive language is most impactful. Thank you for sharing your personal experiences and creating a safe place to discuss this topic. I learned how to respectfully discuss proper questioning in terms of pronouns and sexuality in the patient/doctor setting. This talk was very helpful. I learned how to create a welcoming environment for the LGBTQ community. Wonderful talk! Thank you so much! Thank you so much. I’m always seeking to gain information and tools to be a better ally. I’d like to find more and better ways to signal openness and make myself available. I learned to admit gaps in knowledge and to apologize for inadvertently offending (without being defensive). Thank you for the lecture. It made me realize a lot things that I was not aware of. I will definitely practice some of the things you suggested to make my LGBTQ patients more comfortable. 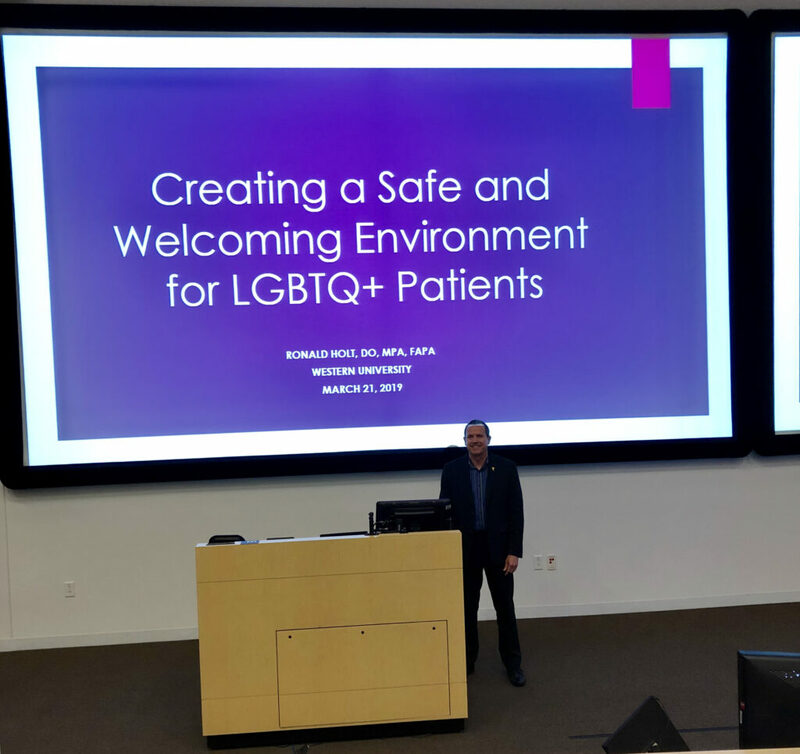 I thought this talk was important for us as future healthcare providers to be very welcoming and open and cognizant for LGBTQ patients in order to provide the best holistic care. Great talk. I felt I already knew a majority of the content covered before coming in, but was still nice to hear about it. I learned to be mindful and accepting. I really enjoyed your talk. Thank you for speaking to us. I will carry the points of this talk with me to implement in my career as a future physician for my patients. I learned that it’s ultimately about the patients always. We as physicians must learn this from the beginning and practice being the best physician we can be both clinically and socially with our patients and society. Another thing I learned was that it’s ok to be different. It was extremely helpful understanding the struggles of trans patients and I’ll always be supportive of them. I learned how to make a waiting room more accepting. Very informative. Appreciated all the examples. Thankful for the resource. I learned how to ask a question that allows my patient to feel comfortable answering. Excellent. I learned how to interact with LGBTQ+ patients even before they walk into our clinic to make them feel comfortable and welcome. I feel that it’s important to personalize health care, especially for patients in marginalized and underserved populations. It is very interesting to hear about real life examples, including Dr. Holt’s own journey. I learned how to verbally and non-verbally make LGBTQ+ patients comfortable. I can/will want to include LGBTQ+ friendly themes into my practice, such as pin on white coat, office decoration, intake form and website. I learned ways to talk to and things I can do to help those in the LGBTQ+ obtain the best possible health care, and feel safe, comfortable, heard, and supported. I’ll be more mindful to make my office and practice as inclusive as possible. I hope to use my own story to make my future patients and colleagues feel safe. I learned having an inclusive waiting room makes a big impact from the start; to have an inclusive intake form; to normalize the conversation to make them feel more comfortable talking to you; and be honest about your knowledge. Reminded me of key details on how we should all be able to practice to help pt feel comfortable. Patient encounter language is important. I learned serious issues facing trans people (40% suicide attempt). Learned to introduce myself then follow with a pronoun; normalizing the conversation to allow them to feel comfortable to open up with you. I learned about asking more open ended questions and to normalize the conversation. The talk was very helpful. Learned opening the door for your patients to feel safe and share with you; importance of gender neutral bathroom, and LGBT friend office (magazines). If your patient says ‘no’, ask if you can talk to them about the topic during your next visit. I learned how to set the stage for someone to feel comfortable. This talk will help me in the future when meeting with patients with gender and/or sexual identities that differ from mine. I learned that initial impression is so important to making the patient feel safe and comfortable. Making sure that the waiting room started that impression with media, signage, brochures, etc. Create positive first impressions. Choose your words carefully. Positive first experiences reduce risk factors. I learned to keep pamphlets and other resources in my office geared toward LGBTQ communities to make them feel comfortable. This presentation provided a different perspective on the LGBTQ community and provided many practical ways to approach this group of people.